Istanbul deserves its title as 2014 Kennerspiel des Jahres, combining vibrant theme and art with an intricate yet easy-to-grasp design. The gameplay follows a simple pattern, yet the strategies can be quite complex, and while there is very little direct player confrontation, the decisions made by one player can undo the plans of another — or open up new possibilities. Theme: Players act as merchants in a classic Turkish bazaar, acquiring (and selling) trade goods, upgrading their wheelbarrow, paying bribes, gambling, etc. The art on the sixteen tiles which make up the bazaar invoke the chaotic and colorful nature of the setting, creating a “bustling” environment without the game components actually interfering with play. Design: The actions of the game, once learned, are all represented by iconography. This game can be language-independent: only the rules require an appropriate grasp, but once learned, the visual nature of the game makes it easy to play without much rules consultation. Gameplay: The Merchants are represented by thick wooden discs, with an additional sticker to indicate which piece is the player’s “main” piece. Thinner wooden discs of the same color represent that Merchant’s Assistants, which are the workers you will place in this worker placement game. Merchants have four of these Assistants at their command in the beginning, but can acquire a fifth later on. A player’s turn involves moving their merchant stack (the Merchant, and any unplaced Assistants who follow in his wake) either one or two horizontal or vertical spaces within the 4×4 bazaar layout, then either dropping off an Assistant or picking up an Assistant on the destination tile to use the action of that tile. The interplay between the tiles is quickly evident — the three Warehouses allow a player to load his Wheelbarrow full of the particular good stored there; the two Markets demand a specific set of goods, and pay out more depending on how much of the order you can fill; the two Mosques require you to have an amount of goods available (increasing as more players visit), then pay one of that good in devotion to get a permanent special ability. The Wainwright lets you add an extension to your Wheelbarrow (cleverly represented by slats you add to a punch-out gap in your starting Wheelbarrow tile), which enables you to hold more goods. The Black Market and Tea House allow you to test your luck and improve your fortunes by rolling dice. The Sultan’s Palace and Gemstone Dealer require specific goods or larger amounts of lira (coins), respectively. Several of these tiles will eventually reward you with Rubies, which are the stepping stones towards your endgame. Endgame is triggered when any player acquires 5 Rubies (6 if playing a two-player game). Players complete the current round of turns so everyone has had the same number of game turns, then may turn in any Bonus cards for goods or money. If more than one player has the highest number of Rubies, there are tiebreakers to check. With so many options, there is no one true strategy to the game, so players will often divide and try to work on particular areas of the board. However, it is possible to get in each other’s way! If a player’s Merchant ends their turn at the same place as another player’s Merchant, the moving player must pay 2 lira to the player who is already occupying the tile, if they want to use the action. This payment is not applicable at the Fountain, which allows any Merchant to recall all of their Assistants from wherever they are on the board. You might also encounter the Governor or the Smuggler, both of which can help you advance your game, at the cost of either coins or trade. And if a Merchant has gone to the Police Station and sent forth their shady Family Member to do their bidding, you may find them in the midst of the marketplace, where you can turn them back into the Police for a reward. Players can acquire Bonus cards throughout the game, which will enable various tricks like “no-movement” turns, “extra-movement” turns, use of a bazaar tile twice in a turn, and so forth. These can lend vital momentum to a game, as you will be able to reach tiles before opponents, or shut them out unless they pay you a fee. The bonus cards that provide free money or free goods can give you what you need just in time. The game offers varying levels of difficulty in the bazaar setup, with three sets of numbers that dictate possible layouts of the tiles. Short paths group places that interact well close together; long paths put them farther apart. The tiles may also be laid out randomly (with some limitations specified in the rules), for those who want a shifting strategy. Istanbul has an interesting approach to classic worker placement, using the Assistants as a finite resource that must be managed over a period of turns, combined with path-based strategy, the potential for player collision, and ways to pay to continue taking actions instead of being shut out of particular approaches. It is an entertaining game that is more complex than standard entry-level boardgaming fare, but not so overwhelming as to turn new players off. The game can be taught relatively easily, and is unlikely to have the same gameplay twice. There are a fair number of components, and as mentioned in a previous review, not enough bags to adequately separate them. My personal copy of the game has been obsessively rebagged, with each color’s components occupying their own bags, and so forth. The game takes a little bit of setup, and organizing the components ahead of times goes a long way towards minimizing that setup time. It is not a heavily interactive game, but the need to follow certain paths and the desire to complete certain objectives in a particular order can lead to players strategically working against their opponents, either forcing them to reevaluate their strategy or to pay out to use an occupied space. This is not a game for those who prefer direct conflict. The cardboard and wooden components are all well-made, solid and unlikely to be easily damaged. All told, this is a substantial game for its price, well worth the money spent to bring it to your gaming table. 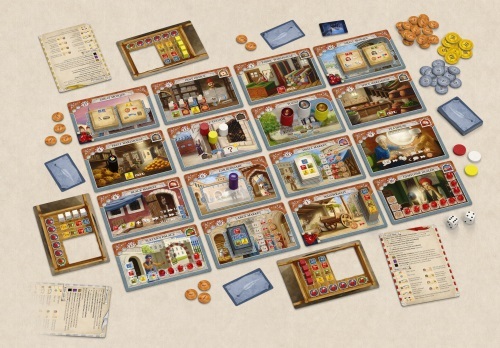 This game won the 2014 Kennerspiel des Jahres award and for good reason too. It’s a slight twist on the worker placement mechanic which is now very familiar to us and is accessible to folks new to designer game play. Pick up deliver your assistants (You’re the merchant) to gather goods around the bazaar which are 16 tiles payed out in a 4×4 pattern the tiles are a little bit larger than 5″ X 3″ tiles, or sell goods to the market or visit the Mosques for game altering tiles or buy rubies. You collect all of these things into your wheelbarrow, which is limited at first but can expanded by visiting the Wainright to increase your capacity to hold more goods. Goods and money will allow you to attain rubies which is what you’ll need to win the game, five for a 3-5 player game and six for a 2 player game. You and your assistants are stacked discs of your color and the concept of picking up the stack and moving it one or two tiles is easy for most to understand, you either pick up an assistant or leave one behind to be able to perform the action of that tile, if you can’t you simply aren’t allowed to take that action. There are a few more interesting things that happen in this game, I highly recommend that you watch a video board game review for more details. My wife and I really enjoy playing this game (there’s a two player variant) and let me say this, she is NOT a board gamer per se though I tell her all the time that technically she is, lol. The iconology used in this game just makes sense, less words means less confusion. Each player receives a players guide about bonus card, turn sequence and other info about game play but once you’ve played Istanbul a few times you’ll find yourself not having to look at the player guide or rule book very much. This game is FUN to play! The synergy, the smoothness, the balance and uniqueness, the way it integrates the theme and mechanics together for a well balanced and harmonious flow is all impressive. The “decisioneering” we experienced was exquisitely agonizing without being frustrating or tense. And the amount of interaction in how virtually every turn your moves directly affect the other player’s choices and options is especially refreshing for this style. There were multiple strategies and multiple tactics from session to session because the board is randomized. Yet the components are familiar enough from each game that we instantly took to the mechanics. Despite the rules lacking an FAQ to explain some ambiguities that should’ve been obvious to the designers, the rules are actually one of the best I’ve ever seen. The layout and the graphics and their examples and illustrations are superb. Everything is exceptionally well put together in that regard. This is a real gem: an intriguing euro worker placement game of distinction –yet with tiles and dice no less. Conclusion, I will rate the game a 9.5 out of 10. My wife rated it 8.5 out of 10. So it’s a 9 for us. We have very few games we would rate as a 9. This game is a must have for any strategy game lover. It’s fast (30min or 45min), lots of re-playability, with awesome mechanics! It hits my gaming table every week, and more than once, two or three times in a row. It’s really awesome. The funny thing is, even it being an AWESOME game (and I can’t say this enough times), and even having won the Kennerspiel des Jahres 2014, people don’t get this game enough attention…. Don’t know how, but probably the thematic may seam a little too specific (turkish merchants on the Istanbul Bazaar doing business) but that’s the real fun in this strategy game: an odd theme to an awesome game filled with great moving mechanics that makes your journey into the world’s biggest bazaar market, in Istanbul, really enjoyable and totally feeling like its a real race against other merchants on a busy day at the bazaar. Favorite strategy game of 2014 for me! Cheers! This game has beautiful components and is well designed. The artwork is gorgeous! But I love it most because there is no luck; it is all strategy, yet plays in only about 45 minutes. The game board is made of interchangeable tiles, so game play and strategy change every game, keeping it fun and infinitely replayable!! Every game you replan your best moves trying to collect 5 rubies before your opponent does. The mechanisms and movement in this game are very unique and keep you on your toes. Great game!! I was unsure how good, Istanbul would be. I had read many good things on the game, but was on the fence on if this would be my type of game. It is easily in my top ten games list. The movement system is very simple, yet offers a ton of depth and complexity. My group is finding it to be a game that needs to get back to the table more. It appears like the resolution may take a long time, but it plays surprisingly quick in my opinion. Add a Review for "Istanbul"